Kevin Hayes celebrates in the Rangers locker room with the Broadway Hat after a three-point night in a 5-3 win over the Oilers. AP Photo via Getty Images courtesy NYRangers. Mark this one as one that was everything and more. Oilers/Rangers I lived up to its billing. The first of two games between two of the NHL’s most exciting teams with the rematch in Edmonton on Nov. 13 saw them combine for eight goals. However, it was the more experienced and deeper Blueshirts who prevailed thanks to a Rick Nash goal with 1:21 left for a thrilling 5-3 comeback win over the Oilers at MSG. Three times, they trailed by a goal. In all three instances, the Rangers came back to tie a seesaw contest that its share of skating, transition, scoring chances, defense and goaltending on both sides. The first ever meeting between student Cam Talbot and teacher Henrik Lundqvist was fun. Even though they gave up a total of seven goals with Talbot allowing Nash’s rebound on doorstep at 18:39 of the third period, both had their moments. Prior to allowing Nash’s go-ahead tally off a wonderfully constructed play set up by the relentless Mats Zuccarello, Talbot made two big stops thwarting Chris Kreider and J.T. Miller. He faced more pressure finishing with 26 saves on 30 shots. Lundqvist wound up with 21 saves to win for a second straight start. He had a dangerous Connor McDavid shot sail high and over the net with the game still tied. Even though he got the primary assist on Ryan Nugent-Hopkins’ first of the season on a power play, it wasn’t a memorable night for McDavid. His line with Jordan Eberle and Milan Lucic had a rough game going a combined minus-10 with McDavid minus-three at even strength. The line that did most of the damage for the Rangers was the newly minted third scoring unit featuring Miller, Kevin Hayes and Michael Grabner. For a second consecutive game, the cohesive trio dominated five-on-five combining for seven points (3-4-7) with a plus-eight rating. The way they’re going, suddenly it’s pick your poison for opponents. Especially with Mika Zibanejad and Derek Stepan only having a combined two goals while anchoring the top two lines. On a night where they didn’t get any production from the Zibanejad unit, the Hayes line connected three times including Miller’s bank shot empty netter that sealed it with 64 seconds remaining. Did he call it? The fourth line also was instrumental with Brandon Pirri’s unit responding to an Adam Larsson go-ahead tally with Jesper Fast redirecting a Pirri shot past Talbot to tie the game 3-3 with 10:29 left in regulation. A nice reward for a hard working player who atoned for a double minor for hi-sticking that led to Edmonton’s first goal. Brady Skjei continues to excel picking up a pair of assists (4, 5) in 24 shifts (17:50). The rookie’s game is coming together. Right now with him assuming a role on the power play and playing well defensively, Keith Yandle isn’t missed. Especially given the contract he got from the Panthers, which the Rangers couldn’t afford. Even Nick Holden was solid playing responsible in his end while contributing two helpers including his one-timer off a Stepan pass which forced Talbot into a tough save, allowing Nash to pounce for the game-winner. Holden also assisted on Miller’s empty netter with help from Hayes, who’s been much more noticeable defensively. A welcome change from Year Two. It resulted in the third consecutive victory with each coming on home ice. In fact, the Blueshirts have won their last five at MSG. The only defeat came last Friday at Carolina by a count of 3-2. Their next game is a rematch at Boston on Saturday night. The first game since David Pastrnak’s illegal check to Dan Girardi which resulted in a two-game suspension. The good part is he’ll be in the Bruins lineup. However, it’s not like the Rangers have any toughness. So, the talking will probably come in their play. Right now, it’s all working. They take their 8-3-0 record on the road this weekend before returning to Broadway for home tilts against Winnipeg and Vancouver. Then they hit the road for four. Notes: Ryan McDonagh had his eight-game assist point streak end. He led all skaters with 24:12 of ice-time including 16:35 even strength, 4:32 PP, 3:05 SH. 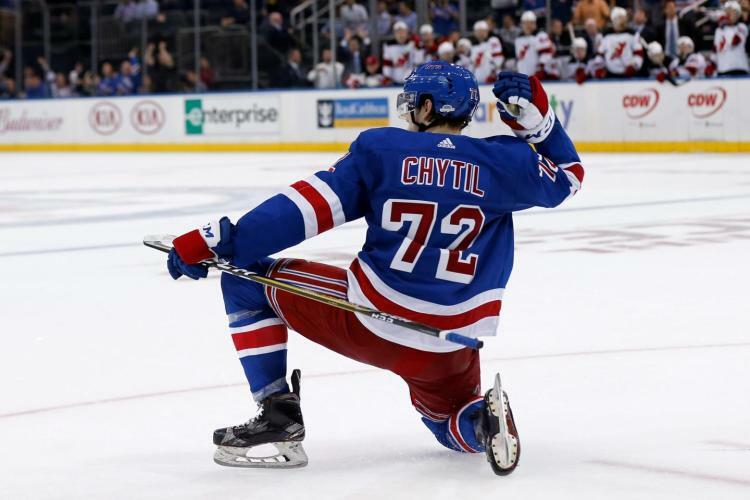 … Ice-times for other 5 NYR defensemen: Dan Girardi (19:47, 16:42 EV, 3:05 SH), Holden (17:25, 15:35 EV, 1:17 SH, 0:33 PP), Marc Staal (17:38, 14:11 EV, 3:27 SH, Skjei (17:50, 16:21 EV, 1:27 PP, 2 secs PP, Kevin Klein (17:24, 15:12 EV, 2:12 SH). … Face-offs were 35-32 Rangers led by Zibanejad (10-and-8). Mark Letestu went 9-and-7 for the Oilers. … Edmonton went 1-for-4 on the power play with Larsson’s tally coming after it expired. The Oilers penalty kill dominated the Rangers, who took the collar in three chances. This entry was posted in NYRangers and tagged Adam Larsson, Brady Skjei, Cam Talbot, Connor McDavid, Edmonton Oilers, Henrik Lundqvist, J.T. Miller, Jesper Fast, Jordan Eberle, Kevin Hayes, Mats Zuccarello, Michael Grabner, Milan Lucic, Nick Holden, NYRangers, Rick Nash, Ryan Nugent-Hopkins. Bookmark the permalink.